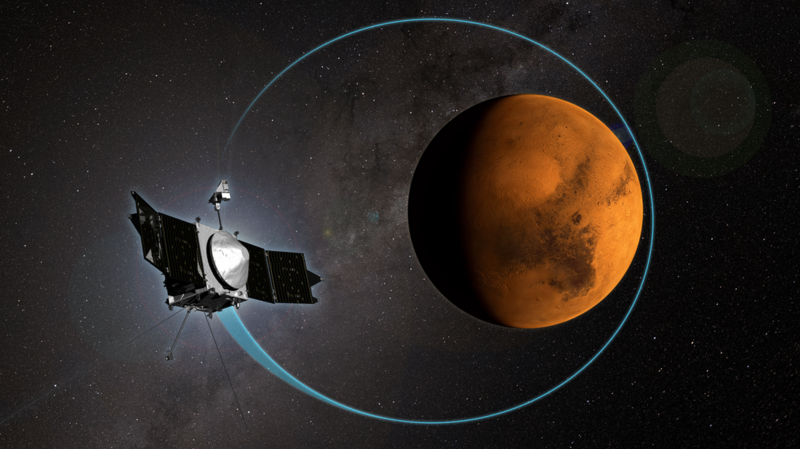 The MAVEN spacecraft in orbit around Mars is getting ready for an interruption in its busy science mission to wait out this year’s solar conjunction when Mars and Earth line up on opposite sides in their respective orbits with the sun in between, preventing reliable communications between Earth and Mars and thus requiring all missions on or around the red planet to come to a stand still. Over the past months, MAVEN continued its science mission that places particular focus on unlocking the secrets of the Martian atmosphere and atmospheric loss processes with MAVEN in a highly elliptical orbit to get a good overview of activity when flying high above the planet and being provided with an in-situ look into the upper layers of the atmosphere when coming within 150 Kilometers of the planet. Two interesting phenomena were discovered by MAVEN as part of its initial science observations – a previously unknown dust cloud that exists high within the Martian atmosphere and an aurora that reached deep into the tenuous atmosphere of the planet. The mysterious dust cloud – observed at altitudes between 150 and 300 Kilometers – could not be predicted using data from earlier missions or by using models of known processes ongoing in the Martian atmosphere. The composition of the dust and its source are not yet known, making this a tantalizing new discovery coming early in MAVEN’s science mission. Scientists hypothesize that if the dust originates from the dense atmosphere, some unknown process must be at work, ejecting the dust to such high altitudes. But there are other potential sources of the dust such as Mars moons Phobos and Deimos or an accumulation of solar wind particles. 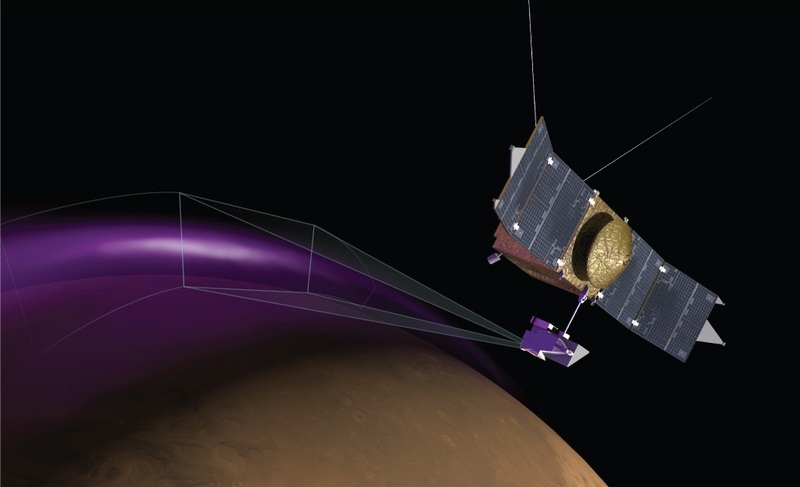 The dust cloud was discovered by MAVEN’s Langmuir Probe and Waves (LPW) instrument. Continued measurements showed that the dust persists over time and is not a temporary phenomenon. Measurements also showed that the cloud is extremely thin and no other instrument on MAVEN picked up the dust’s signature, hence its presence will cause no harm to spacecraft in orbit around Mars. Yet, uncovering the source and mechanism that creates this high-altitude dust is highly desired by scientists. 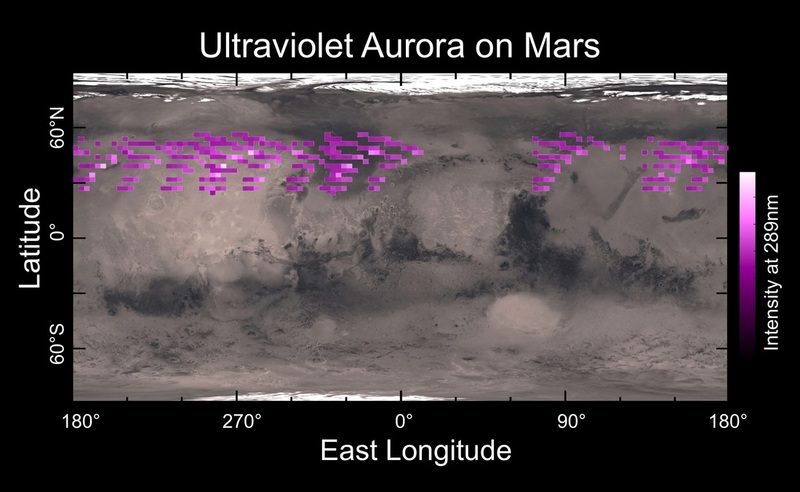 The Ultraviolet Aurora on Mars was observed by MAVEN for five days just before December 25, 2014. Dubbed the Martian Christmas Lights, the aurora was seen in the northern hemisphere of the planet. The mechanism behind the auroral display is well understood, but what surprised scientists was how deep the aurora penetrated the atmosphere – much deeper than on Earth or anywhere else on Mars. The source of energetic electrons creating the aurora appears to be the sun as MAVEN’s Solar Energetic Particle instrument detected a significant peak in the inflow of energetic electrons coinciding with the onset of the aurora. Because Mars lost its global magnetic field early in the planet’s evolution, energetic electrons can directly interact with the atmosphere and at very high energy levels can penetrate the upper layers of the atmosphere to an altitude of less than 100 Kilometers above the surface. On April 6, MAVEN made its 1000th orbit around Mars – four and a half months into a one-year primary mission that is hoped to be extended by several years based on the performance of the orbiter. “The spacecraft and instruments continue to work well, and we’re building up a picture of the structure and composition of the upper atmosphere, of the processes that control its behavior, and of how loss of gas to space occurs,” said Bruce Jakosky, MAVEN’s principal investigator. 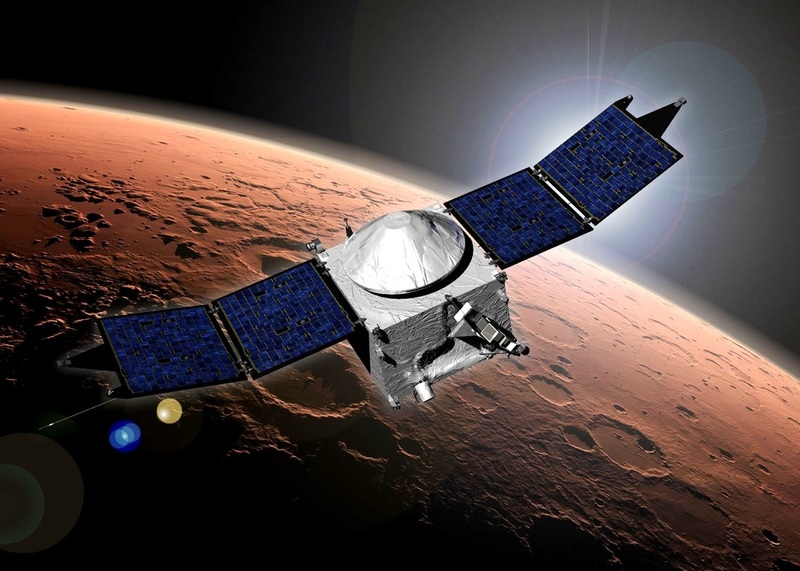 On April 18, MAVEN entered its second Deep Dip Campaign, the first having been successfully performed in mid-February. These Deep Dips are designed to step MAVEN’s periapsis altitude deeper into the atmosphere by making a set of small propulsive maneuvers around the apoapsis passage of the spacecraft. Spending several days in this lower orbit will allow the spacecraft to make in-situ measurements in a more dense area of the atmosphere to get a better picture of atmospheric composition and physical processes ongoing in the upper reaches of the atmosphere. Five of these deep dip campaigns are planned over the course of MAVEN’s one-year primary mission, each lasting five days amounting to about 20 orbits and 20 passes through the lowered periapse. The maneuvers brought MAVEN into the atmospheric sweet spot where the accelerometers aboard the craft are able to detect a density between 2.0 and 3.5 kg/m³ – a zone in which atmospheric gas can be measured but the spacecraft still maintains a safe orbit without risking entry into the dense atmosphere. In its normal science orbit, MAVEN encounters an atmospheric density of 0.05kg/m³. The actual dip into these dense atmospheric region lasts for just ten minutes per orbit during which all instruments are actively gathering data on the particle and magnetic environment in the upper atmosphere. The second Deep Dip campaign reached an altitude as low as 131.5 Kilometers allowing MAVEN to study the sub-solar region. Each Deep Dip Campaign targets a different region above Mars at different times of day to examine local and temporal variations in atmospheric density and composition. Four maneuvers were carried out as part of the second campaign requiring a total delta-v of 12.4 meters per second and placing MAVEN into an orbit with a periapse altitude of 168 Kilometers at the end of the operation on April 23. MAVEN is currently in the process of setting up for this year’s solar conjunction – a period of time when the sun obstructs the line of sight between Earth and Mars and prevents reliable radio communications – requiring all missions on or around Mars to stand down. During the three-week solar conjunction centered around June 14, the spacecraft is sun-pointed with the Articulating Payload Platform parked in Sun Safe Position – suspending science operations for the duration of the conjunction and one week to prepare beforehand and one week to recover the vehicle afterwards.